Outer layer of gray matter called cerebellar cortex. 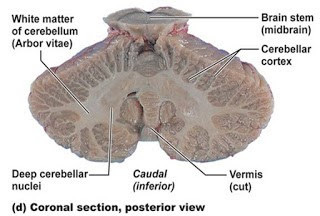 Inner central core of white matter which presents a pattern like branching of a tree projecting superficially beneath the cortex of each and every folium, called arbor vitae cerebelli. Inside the substance of white matter are embedded mass of gray matter called cerebellar nuclei. Cortex is made up of following cerebellar neurons arranged in three layers. Outer molecular layer: Stellate cells and busket cells. Intermediate layer of Purkinje cells: Purkinje cells. Inner granular layer: Granule cells and Golgi cells. Neuroglia are present in all the layers. Principal cells of cortex are Purkinje cells. It receives afferent input entering cerebellum through following two different routes. Some of cerebellar afferent relay in Purkinje cells reaching upto superficial molecular layer. Some afferent reaching the innermost granular layer relay in granule cells which pass further superficially to relay in Purkinje cells dendrites in molecular layer. Through both the ways Purkinje cells receive excitatory impulse continuously. This excitatory impulse in relayed to neurons of cerebellar nuclei in deeper white matter. Axons of cerebellar nuclei pass out as efferent to carry the same excitatory impulse. But this impulse is limited time to time by inhibitory influence of stellate cells, busket cells and Golgi cells of cortex on Purkinje cells, so also on cells of cerebellar nuclei.